Sorry... the 2017 Buick Regal is no longer being sold as new. 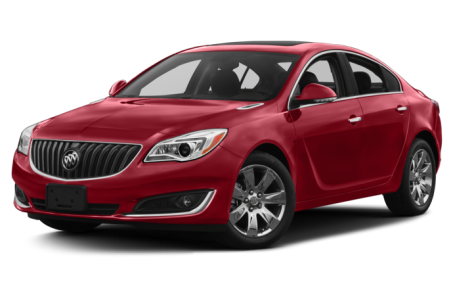 The 2017 Buick Regal is a premium mid-size sedan that seats up to 5 passengers. It competes with the Mercedes C-Class, Audi A4, and Acura TLX. This year, it remains largely unchanged. Five trims are available: the 1SV, Sport Touring, Regal, Premium II, and GS. Overall, the Regal has plain, conventional styling. The front bumper features a prominent grille mounted between a pair of sporty headlights. The lower fascia has a wide, smiley appearance. Body sculpting is kept to minimal to maintain a smoothened look. At the rear, a chrome bar stretches across the trunk, flanked by LED taillights. Standard features include HID headlights, fog lights, power/heated side mirrors with turn-signal indicators, and 18-inch wheels. LED signature lighting, a rear lip spoiler, and larger 19-inch alloy wheels are available. The GS Group trim also comes with a unique front and rear styling as well as special 19-inch V-spoke wheels, larger Brembo front brakes, and HiPer Strut front suspension. Under the hood, the Regal is powered by a standard 182-hp, 2.4-liter direct injection 4-cylinder engine mated by a 6-speed automatic transmission and front-wheel drive. All-wheel drive is available for the Regal and higher trim levels. The Sport Touring and higher trim levels have a more powerful 259-hp, turbocharged 2.0-liter 4-cylinder mated to a 6-speed automatic or manual. Fuel economy for the 2.4-liter models is an EPA-estimated 21/29 mpg city/highway. It lowers to a 19/27 mpg rating for the GS Turbo 2.0. Inside, the Regal has a premium leather-trim interior with a 60/40 split-folding rear seat. The center stack features a standard Buick IntelliLink multimedia system, which includes an 8-inch touchscreen, Apple CarPlay/Android Auto compatibility, Siri Eyes Free mode with voice recognition, Bluetooth connectivity for phone and audio, and a USB port. It can be upgraded with an integrated navigation system, OnStar 4G LTE connectivity with Wi-Fi hotspot (subscription required), and a Bose premium audio system. Standard features include dual-zone automatic climate control, power/heated front seats, cruise control, remote keyless entry, push-button start, and remote vehicle start. Available features include sport pedals, a leather-wrapped sport steering wheel, and an enhanced 8-inch instrument display. The Regal earned a full 5-star overall crash test safety rating from the National Highway Traffic Safety Administration (NHTSA). Standard safety features include a backup camera and a tire pressure monitoring system. Available active safety features include forward collision alert, lane departure warning, a blindspot monitoring system with rear cross traffic alert, collision mitigation braking, and adaptive cruise control.